The snack giant's failed attempt to acquire Hershey could leave it open to a takeover itself. Companies might find Mondelez International's global footprint a healthy snack for their own portfolios, though its price and size would likely exclude all but the biggest in the industry. Image source: Getty Images. Both before and now after Mondelez International's (NASDAQ:MDLZ) attempted takeover over of Hershey (NYSE:HSY), the snack foods giant was seen as a potential takeover target. While CEO Irene Rosenfeld says she's still committed to creating value for shareholders, even through additional acquisitions, the failed merger with the chocolatier was seen as one of its best defenses against a buyout offer being made for it. 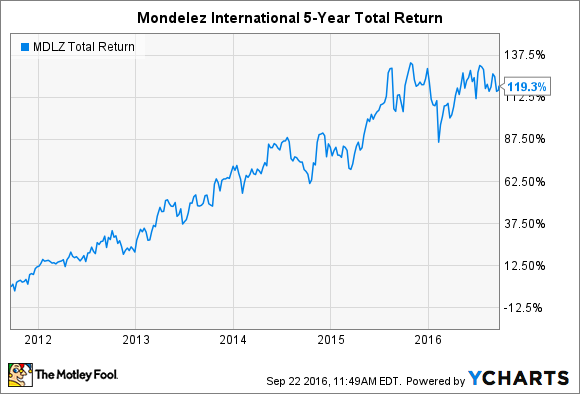 MDLZ Total Return Price data by YCharts. Certainly its imposing $67 billion market cap presents an impediment for someone making a bid, but there are still a few companies that could make a go of it, and the three companies below are prime candidates. Controlled by 3G Capital, the merger that resulted in Kraft Heinz (NASDAQ:KHC) was the product of the Brazilian hedge fund teaming up with Berkshire Hathaway (NYSE:BRK-A)(NYSE:BRK-B) to visit divine retribution on the processed foods company for spinning off Mondelez over Buffett's objections. In 2012, Carl Icahn's Trian investment vehicle urged a breakup of Kraft Foods just two years after acquiring chocolate company Cadbury for $19 billion. When Mondelez was spun off, the chocolate business went with it, meaning an acquisition of the global snack food company would largely bring most of the pieces back together. With an enterprise value of $135 billion and a stock trading at new highs, it would have the wherewithal to make an attempt. Coupled with reciprocal support from 3G Capital, reuniting Mondelez with Kraft Heinz would give Buffett his company back. However, Buffett has also said his company needs a couple of years to finish digesting its own merger before swallowing someone new. Another billionaire investor has long sought to have his investment team up with Mondelez. Nelson Peltz had argued forcefully that Pepsico (NASDAQ:PEP) should acquire the snack giant, though CEO Indra Nooyi successfully resisted the overtures. Peltz rationally argued that Pepsi investors would be best served by separating the beverage business from the Frito Lay snack business, which could be then merged with Mondelez. He showed how the snack segment was being held back by declining consumption of soda while the snacks industry was growing, a phenomenon that continues today. Pepsi rejected that course, saying drinks and snacks were complementary and belong together, but Nooyi did give a Peltz ally a seat on the board of directors, a position from which he could argue that an acquisition of Mondelez is still in the best interests of investors. One company that has often come up in a list of potential Mondelez suitors is General Mills (NYSE:GIS). Although best known for cereal brands like Cheerios and Lucky Charms, General Mills has made a concerted effort to expand its presence in the snack-foods industry, acquiring several companies over the past few years, including Annie's, which was best known for its organic mac and cheese, and more recently, upscale meat snacks maker Epic Provisions. Although both of those businesses follow the natural-foods trend sweeping the industry, something General Mills has sought to emulate in many of its businesses by removing artificial ingredients and colors, the packaged goods leader still knows how to get its fat on, owning brands like Bugles and premium ice cream maker Haagen-Dazs. With a $46 billion enterprise value, taking on a Mondelez acquisition would also amount to punching above its weight class, not an impossible or unheard of task, but one that makes it more difficult. Still, a deal would give General Mills a big boost and greater global heft. Mondelez International is seen as a prime takeover target because of its premier standing in snack foods, and activist investor Bill Ackman disclosed a year ago that it had taken a sizable stake in the stock because he sensed it would be a candidate. However, there are a number of factors that could work against that happening, including its size and stock price, which would make any attempt expensive. While other suitors like Nestle could emerge for what would be seen as more just than a tasty morsel for their portfolios, Mondelez International might just end up being a better stand-alone business to invest in.